In many ways our opportunities are strongly influenced by where we live, making affordable housing options in healthy communities critical. Children, older adults, veterans, people with disabilities – different generations and demographics have different needs. Where and how we live can have a profound effect on their lives. We have jobs that pay across the spectrum, including entry level and professional and career academic, and executive. The painful news? 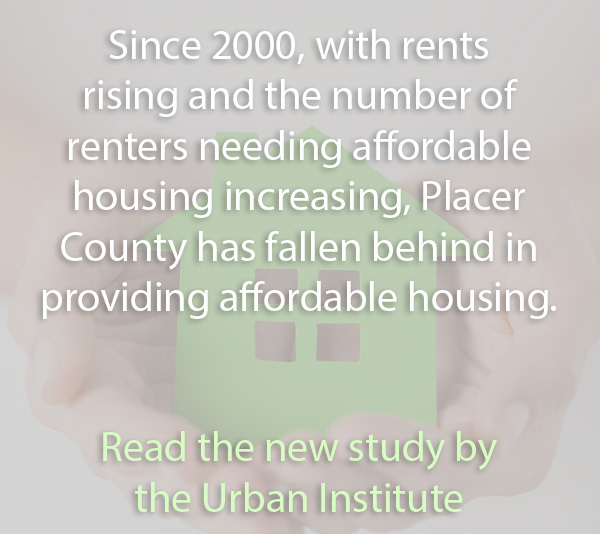 The painful news is that many of our committed employees are simply not able to afford a home in Placer County. We realize that if our employees are not able to afford homes, it makes it very difficult for them to make a long term commitment to the University. Affordable housing is a big issue when it comes to attracting top-notch employees and we strongly support local development that keeps all income levels in mind. Our 2,400+ workforce spans the economic arc, from introductory jobs to executive management, and it is important that our team members have the ability to enjoy the quality of life here without having to endure a lengthy commute to find adequate housing. Our employees are well drillers, pump installers, lab technicians, and clerical office workers. Of my 20 some employee pool, only two own houses in Placer County where our business is located. One is close to it and they bought their houses 40 years ago when things were more affordable. Three others own houses, but far away in Yuba or Nevada Counties where again housing is a little more affordable. The recent average home sale price was approximately $426,000. From a financing perspective, 20% down if you went conventional and if you have no debt, will require a minimum of $52K annual income. That means no car payments, no credit card bills and that’s dealing with one-third of your monthly income for a mortgage payment. That makes it pretty tough for entry-level buyers. The people are ready, but our local government is not. The current building/development model is not relevant anymore – it’s behind the times and not current with the changes in the economy and in society. The system itself is working against the best interests of what we’re trying to accomplish for the people at large. Information and Assistance calls for housing have increased over the past five years. Five years ago housing calls were ranked number 8 out of top 10 reasons for contacting Seniors First. For the past three years however, calls for housing have increased, and now rank number 5. In our city’s general plan it calls for the city to ensure housing is available for all income types. So if we’re to honor our general plan, the city needs to be proactive in how we’re going to encourage affordable housing to be constructed. As a city we need to provide incentives for building housing that is affordable and meet the needs of our community. Our lives are richer when we live in diverse neighborhoods and when we make housing available in our community for all. It’s the cooks, the people who serve you at the restaurant, the person who makes your drink at the bar—they want to live here too—and they should be able to do so. To make housing affordable for all who choose to live and work in our beautiful county is vital. And we all benefit as a result.